You would think that Labor Day would be a day off right? Yet here I am working and preparing some new ideas new material for the coming weeks. As much as I try to be 100% ready at the beginning of the school year, I find it impossible, because not only is my mind is always whirling around things I can add or do differently but also the needs of the students change, so I love to take Labor Day as my get-ready-for-them weekend. Well, by now (beginning of week 3) I have already read the basics of my students personalities. I already know who is going to struggle more with following directions, who is a hard worker and who will have some difficulty working independently or even finishing a task, I know who could have behavior problems and who will thrive to be the best student in the world, I have started to notice what kids will probably need a Speech Referral, etc. the list is endless but knowing my kids will get me ahead in the game! As part of my initial student profiling, I have also talked to the teacher my students had in First Grade and he added some more insight on my "investigation". He was able to share some info on their fluency development throughout the year. It was interesting to see how my students started and how they ended First Grade as far as words per minute and comprehension. As we analyzed their data, we realized that the kids made very important gains but also concluded that they will need a lot of help to continue with what my fellow teacher started. After all, the goal is to get them ready for 3rd grade when they will face STAAR for the first time and foremost for developing reading as a lifetime skill. I wish reading was all about fluency! being a reading teacher would be 1000 times easier don't you think? Building fluency is not as hard as it seems, comprehending a text is; however in my opinion fluency is the first step to independent reading comprehension. So, that being said, after I went through my student's fluency I also assessed their comprehension and I am currently assessing their phonemic awareness individually. You may be wondering why am I doing all this? The easy answer is: because it is a requirement; the correct answer though is: because it will give me a parameter to work with my kids in small groups (starting soon) and it will help me work with them by specific needs and skills. Another thing that all this data has shown me so far is that my priority right now should be to increase their fluency as much as possible while I add comprehension into the mix. In the meantime I'm multitasking and getting ready for a fluency boot camp and preparing homework calendars. I'm putting together sets of PALABRAS DE USO FRECUENTE or HIGH FREQUENCY WORDS (HFW) and I'm embedding that in their HOMEWORK. If you are like me and try to limit the amount of worksheets sent for homework or have limited copies at your campus, then you will love this calendar that by the way you can download by clicking on one of the HOMEWORK links. I will be posting all my 2nd grade homework calendars before I upload them to my TPT store so make sure to be the first to check them out. OK, now, going back to the HFW; I divided the words in sets of 8 words per week. We will practice those words in the Fluency Drills, Spelling Center, in Early Finisher Work and in their HOMEWORK. 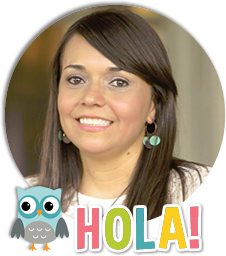 Another item that is crucial is reading at home, for that reason you will notice that my calendar 1) is repetitive week after week to build a homework habit routine and 2) there is a reading element, a phonemic element and a vocabulary element. Now, the first week I added the words from Lesson 3 of Senderos that we studied last week (we had to skip Lesson 2). In the past I used to send the vocab words from Senderos because those were the words that they could find in the text and because they are part of my word work and because we study them every week, etc. etc. however, the following weeks on the calendar reflect HFW instead. Before thinking about it, I printed the student calendars with the Senderos vocab words on the first week instead of HFW and didn't want to reprint them so they will go home like that, the good thing is that the calendar is modifiable so you can change the content if you need to. This year the needs are different and I don't think that sending the Senderos vocab for homework is going to be the most appropriate, besides I found an extra benefit on using HFW, so we will adapt and I will send High Frequency Words for the first time instead, yes for the first time, I know, don't judge me. I am actually liking this idea so much more so far, I just need to prepare bahaha! I will share my HFW plan and activities as soon as I finish with them. Another thing that I need to mention is that I can't share a copy of the books listed in my calendar due to Copyright, but I can tell you what I'm using: The first six to eight weeks I'm using First Grade books from a the previous reading adopted book series, that program suggested one book per week, we read them all in a shorter period of time. I found that some people sell them on ebay or amazon, search: McGraw Hill Reading Practice Book Grade 1 Reproducible BLACKLINE Teacher Resource. Why am I sending first grade books? 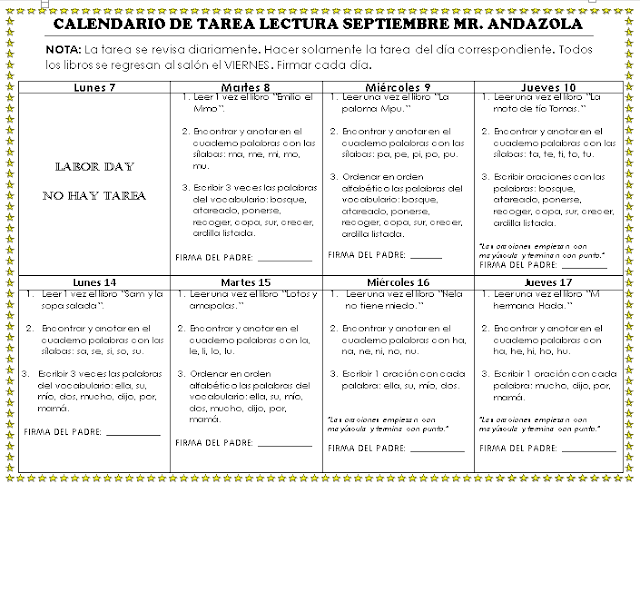 just for warming up our reading engines but soon, the homework will reflect the Decodable Books that come with Senderos, so if you use Senderos you won't have to modify anything to the calendars. I make 2 class sets, send them home then ask the parents to have the kids return them to the classroom on Fridays, then I keep them in ziplocks or use them in the classroom. Thanks to parent support this is the 3rd year in a row that I will use the same class sets! kudos to responsible parents right? Last thing you need to know is that kids do their homework in their binder spiral or wide ruled paper and I check it every morning, I don't grade it but I give them a good point on Classdojo for doing their homework. Again, the whole idea for me at least, is to build the habit of being responsible (plus practicing skills independently of course). Anyways, I have a whole bunch of ideas that I need to work on and share with you guys! I will be doing that right now, make sure you stop by later on and share some ideas of what you send for homework and what you think of my calendar!